With transitional styling that is at home in a number of decorative environments, the Cotterill Collection will be a versatile addition to your bedroom. The two available finishes: Gray or cherry-over birch veneer, dramatically enhance the wood grain and is perfectly accented by the nickel hardware that punctuates each drawer front. Depending on your finish choice the headboard will feature either a black or gray bi-cast vinyl insert with an x-stitching and button-tufting. 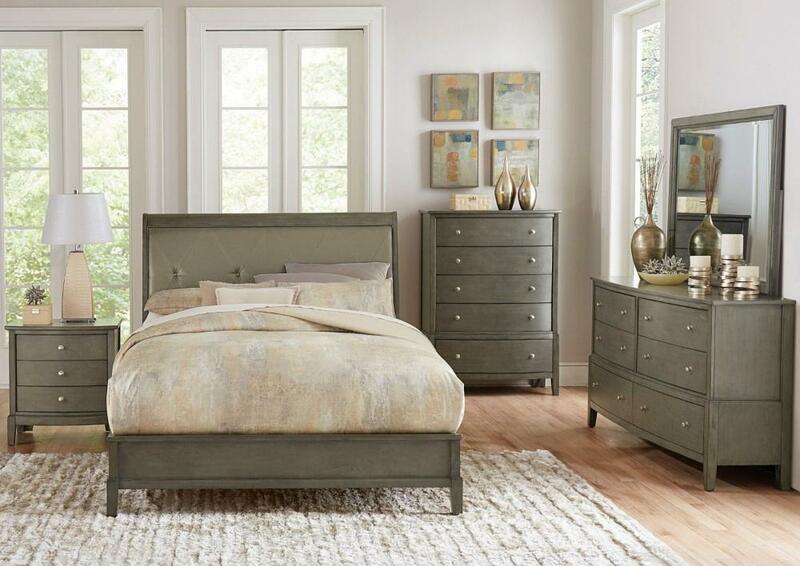 FEATURES: Gray / Cherry Finish ~ Gray / Cherry Bi-Cast Vinyl Headboard ~ Transitional Style ~ Nickel Hardware ~ Dovetailed Drawers ~ Ball Bearing Side Glide.